With the holiday rapidly approaching like a runaway Amtrak train when you’re in a car stalled on the tracks, we’ll dive in and see what wonderful treasures we can dredge up to rescue your “wait ’til the last minute to shop” behinds. Today we’re looking at Books and Toys. Tomorrow we’ll recommend Comedy, Music and Home Furnishings. On Friday, check back for our picks in Movies, Animation, and Food. You can’t go wrong with works by local authors, and you sure will impress the heck out of your gift recipient if you get the book signed and maybe even personalized. 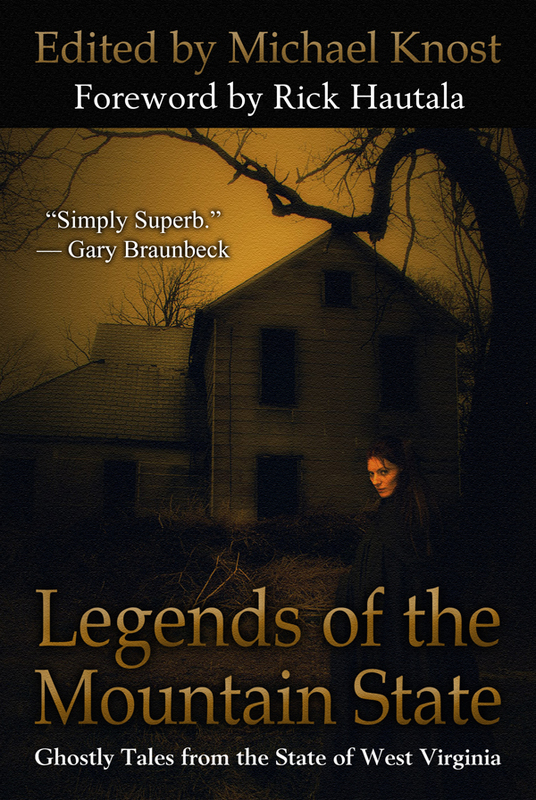 This Saturday at Taylor Books, you can do just that with Legends of the Mountain State: Ghostly Tales from the State of West Virginia. I wrote about it here. The book is an anthology of West Virginia-based horror tales. 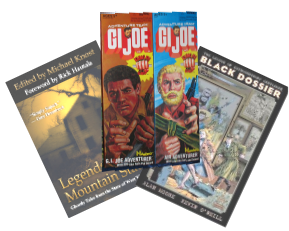 Saturday, December 22, from 1 PM to 4 PM, you can go to Taylor Books and meet the book’s editor, Michael Knost, along with writers Brian J. Hatcher, and G. Cameron Fuller (husband to my fellow Gazzblogger, Karin Fuller). What better way to observe the holiday season than by scaring the bejesus out of somebody with a collection of great scary stories? For those you observing the Greek Orthodox Christmas calendar, you can also head out to Borders at the Huntington Mall on December 29 to get you book signed. If the person you’re buying for has a taste for quality graphic novels, then you’ve got to get them The League Of Extraordinary Gentlemen: The Black Dossier by Alan Moore and Kevin O’Neill. This is the third adventure of the League (don’t let your opinion of the work be colored by the dreadful film adaptation–this is really good stuff), and it’s available in a nifty hardcover edition where ever books are sold. Alan Moore, the man who reinvented the art of comic book writing in the 1980s, brings us more tales of a super hero team consisting of legendary characters from British literature. In this story, set in 1958, the ageless Alan Quartermain and Mina Harker are pursued by a young James Bond, Emma Peel, and Bulldog Drummond, as they battle the oppressive “Big Brother” government from George Orwell’s “1984” (which in this alternate reality is the title that Orwell’s publisher was forced to use in place of the original “1948,” the year this government seized power). Not only is this a top-flight alternative-timeline adventure story, but readers will also be swamped under literary and pop culture references. Everyone from Captain Nemo to Jack Kerouac is fair game. 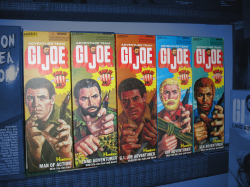 Our sole holiday toy pick this year is a collection of GI Joe Adventure Team Reproductions. I know I picked the Hot Topic release of the Land Adventurer (with life-like hair and Kung Fu Grip) last year, but this year, you can get the whole team for under ten bucks each! Wal Mart, of all places, picked up the ball from Hot Topic and released all five of the Adventure Team GI Joes in reproduction packaging at a price that is less than the originals sold for, when adjusted for inflation. You can go to our two local Wal Mart stores and wander around the toy department until you find these guys. They aren’t on the planogram, so you won’t find them in the action figure aisle, but these guys are well worth the hunt. In addition to the Land Adventurer (with brown hair and beard) and the Air Adventurer (blond hair and beard, and in the correct uniform this time), you will be able to pick up the Sea Adventurer (red hair and beard), the Man Of Action (brown hair, no beard) and The Adventurer (African American, no beard). All five have Kung Fu Grip and come in nifty retro packaging. Seeing these on the shelves might make you feel like you’ve jumped in a time machine and went back to 1974! It’s a perfect last-minute gift for your child of the 70s. We’re going to have more toy picks after Christmas, so you can score on all the great markdowns! Check back tomorrow for more our our half vast Gift Guide. Yeah, the Alan Moore book. Glad you reminded me. Need that.